You can take 25% off of your oder at Olive Juice through tonight at midnight with the code below! This code even works with sale and outlet items, like the Piper bodysuit above. This is one of my all-time favorite collars for babies... my daughter nearly wore hers out. It looks so great under overalls, sweaters, jumpers, etc. 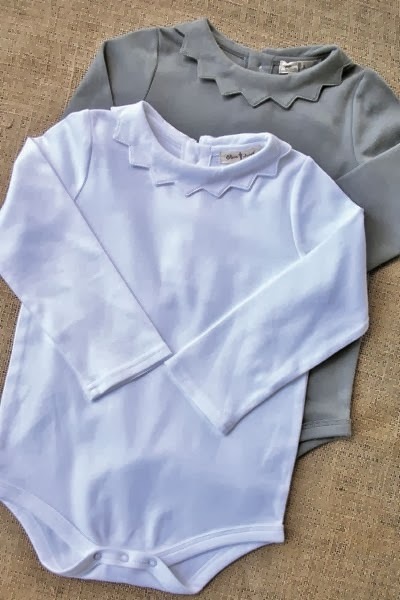 There are some white Piper bodysuits left in the outlet from years past in sizes 6 months through 24 months as well as a silver one in 24 months. The fabric is thick and soft and will not shrink disastrously, especially if you line dry it. Normally $24.50, these little beauties are just $10.31 with the additional discount. Don't forget that this code also works on full-priced items, so if you have been eyeing something from their current collection, this is a chance to get a bit of a discount without waiting for it to go on sale.